For the next 30 seconds, I want you to deep think about the below question and let your thoughts give you an answer. I want you to know that whatever your answer is, it simply boils down to one thing only…Procrastination! And what we do is give ourselves different types of “genuine excuses” to validate our reasons for putting off losing weight. When you are about to start your weight loss journey, sometimes it can seem like an impossible start – especially if you have a lot of weight to lose e.g. you weigh 100 – 120kg and you need to drop 20kg. Giving an excuse such as “being too busy” is like a smoke screen to the REAL reason why you are putting it off. The real reason could be that you are convinced that you may not be able to do it or that you think it would destroy your current routine etc. Solution: You do not need many hours to start dropping fat off your body. All you need is just 20 minutes daily! And I am sure you can squeeze that out of your 24 hours in a day. I’ve seen so many people subscribed to The 30 Day Fat Loss Program with no real belief that it will work for them, and in 30 days they lose between 4kg – 13kg! Do not underestimate your will power. If you genuinely know that a weight loss routine will work for you, you are more likely to do it. Set mini goals for yourself. Start by eating one healthy meal daily in the first week. Then increase it to two, then add 20 minutes workout. I get this excuse many times via email. “Coach Olu, you mean I won’t be able to eat Gala, Coke, Plantain chips, Pounded Yam, etc”. Let’s be real for once, most times, fat loss is usually associated with eating boring food that taste very bland! And this is one of the reasons why we all bring up this excuse. Solution: Do you know that you can eat all the junk meals and still lose weight. Yes, you can eat them on your “Cheat Day”. That is, a day you have set aside to eat just about any meal without feeling guilty. You can even choose a “Saturday” for this. And another good news is that….you can still lose weight while eating amazingly delicious healthy meals if you actually know which meals to eat and how to prepare them. When I show subscribers on the 30 Day Fat Loss Program the meal plan and how to cook the meals, they are surprised at how delicious some of the meals are. For example, one of my subscribers love Indomie so much that I taught her EXACTLY how she can eat it in a healthy way. Guess what…She lost 7kg of fat that month. 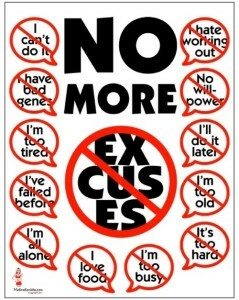 Excuse #3 – Exercise is hard and boring! Getting into exercise can be quite daunting and even painfully hard especially if you are running for hours on the thread mill and lifting weights. But guess what, you don’t need all of that to actually lose weight. Oh yes, its nice to be able to workout in the gym especially if you know what you are doing or have paid several thousands of Naira for a fitness trainer. But you can burn more fat off your body doing just 20 minutes exicing workout from home. I am talking about workouts that will shake off excess fat from even the most difficult places such as the belly or arms. You deserve a good body. You deserve to wear dresses that others will complement you for. You deserve to take pictures without “feeling fat” and all in all, you deserve to live healthily. Don’t let excuses take away what you deserve. Take your weight loss routine one day at a time. Set up Mini “healthy eating” and “workout” goals. And just start working on it. Don’t expect to be perfect with it when you start. Just run with it and you will see the pounds shaking off. I wish you best of luck and I’ll speak with you again.